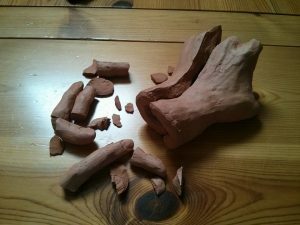 What is there in a piece of broken clay, a simple sculpture, shattered on the floor? On Wednesday, around 3:30AM local time, another devastating earthquake hit the area around the Gran Sasso mountain in central Italy. Early counts put the death toll around 159 and rising. The region is no stranger to earthquakes. In 2009, a quake hit near the city of L’Aquila, killing around 300 people. You can still see the effects of that quake today. This quake hit on the other side of the Gran Sasso (“Great Rock” – the mountain we saw every day), around 50 miles from where we spent three months for the Incarnate School of Arts and Mission earlier this year. One of the staff at the Evangelical Center in Isola was Stefania D’Ascenzo. She, along with the rest of the staff, welcomed us as family. While they were not technically a part of the Incarnate program, they were a huge part of our Incarnate experience, surrounding us with their own brand of Italian welcome, hospitality and love. Stefania in particular, worked hard to create a bridge between us and the local Italian community. 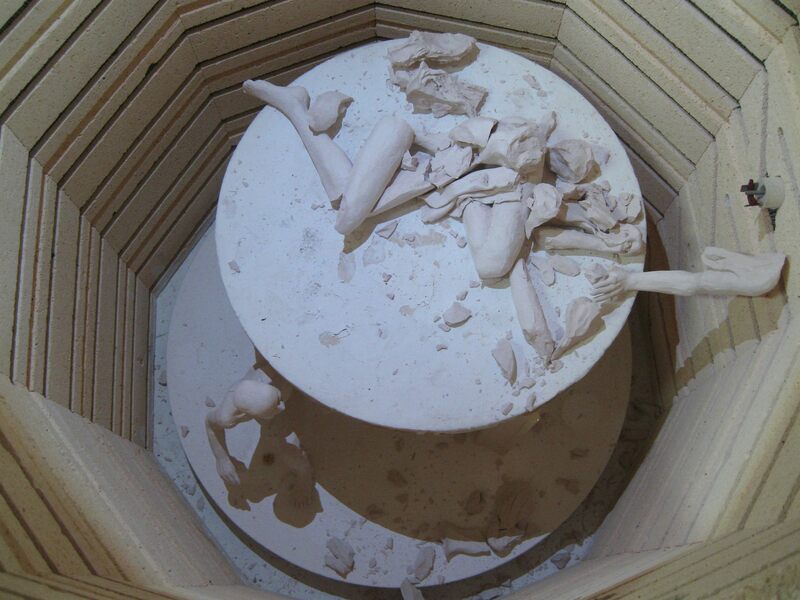 Near the end of the Incarnate program, I realized that I would not be able to bring much of my work home with me, especially any unfired pieces. I wanted to leave Stefania a small token of my personal thanks (among many other things, she was instrumental in linking us up with a local ceramic artist who was able to fire many of my pieces), so I left her with a small sculpture of a hand. It had not been fired yet, but she carefully packed it up and after we had gone, was able to take it the same potter to fire it. On Wednesday, when news of the earthquake started rolling in, it was a shock to those of us who had been in Isola, so close to the center of these towns which were now piles of rubble. However, we were greatly relieved to hear that all of the Centro Evalgelico staff were safe and sound! I responded to a Facebook post which Stefania put up, saying that I was glad to hear that she and the others were safe. Dear Chuck. Thanks. But I m not the one that has really seen broken pieces…… This is THANK GOD one of the very few things that got into pieces last night. Loved ur sculpture but realized how God has been good to us: our fear has nothing to do with the dispair of many more elsewhere! Let’s keep praying!! Suddenly, this quake is very personal to me. 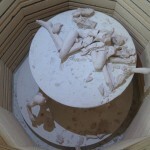 A sculpture is more than just a bit of fired clay. It’s a piece of me. Suddenly, I am in that quake. I have lost something — a part of myself which I have given to another person, as a sign of our bond of friendship, community and shared vision. This photo hits me. It is difficult to put into words, but perhaps that is why art, and the gift of art from one person to another, is so powerful. My loss is nothing compared with what others who find themselves caught in the middle of this tragedy have lost, but it is still my loss, and Stefania’s loss. I am sure I will go on to create many more sculptures of hands, and I may even be able to ship another one to Stefania, but this one, unique, moment in time, captured in a piece of clay, is gone. This photo from Stefania brings me back to another story about a different shattered piece. We are all broken in different ways. Often, we find ways to cover over the cracks and gaps, or pretend that they aren’t there, but they have a tendency to show up at the most inopportune times. Perhaps it is better to see those breaks for what they are — the experiences, people, relationships, good times and bad which make us who we are — and see how God uses each and every one of those breaks to form is into the resilient people that HE intends us to be. It is a way to remember the ties of time and place which link us to the people of the devastated region of central Italy around the Great Rock of Italy. Pray for the people of Italy…. Posted in Blog, OM Arts, Sculpture and tagged clay, community, hope, Incarnate2016, potter. ← Thin Enough to Love?